File this in the “better late than never” category! I’m so proud of the VCW folks that turned out at 3:30 a.m. to be a blessing to the folks waiting in line at the local Walmart on Black Friday. 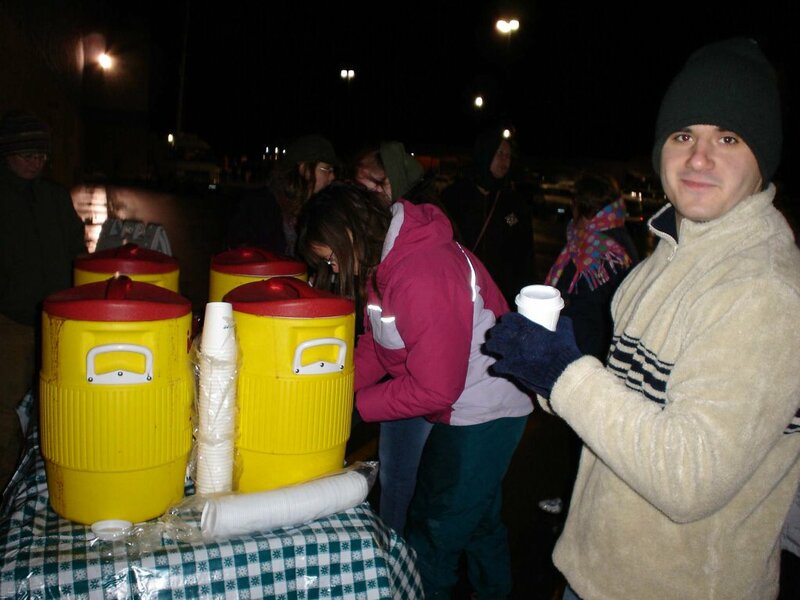 We gave out 350 cups of hot chocolate. 350! I didn’t realize there were that many crazy people up at that time of the day! We did it simply to show God’s love in a practical way. When people rushed our table with money in hand, asking, “Are you selling something hot?”, it was a blast saying, “No…we’re giving it away free.” That was the last thing they expected! Why Walmart? In my almost one year of being in Waterville, Walmart is the only common gathering place I’ve been able to identify. All classes. All races. All ages. All come to Walmart at some point. So that’s exactly where I want our church to be. The best part? They want us back. Often. I’ve been hesitating about responding to your post since I had a somewhat happy, somewhat sad, reaction. First, let me say, what a wonderful and simple expression of caring and community you all did! Cheers! Second…I felt…well…sad at your realization that the only gathering place for all people in Waterville was…Walmart. Having grown up only twenty minutes from WTVL and having most of my extended family there, I remember a vibrant WTVL in my youth when Main St. was bustling, particularly at Christmas. Lately, I have been following some of the objections by some Christians to people wishing them a Happy Holidays instead of Merry Christmas, feeling that people are taking the Christ out of Christmas. I think that if we look more closely at the expressions of Christmas that people purchase at places like Walmart(oh, say a blow up Grinch dressed as Santa placed next to the manger on someone’s front lawn) If we consider that our community is now gathering at Walmart to consume and not so much on our Main St and in our churches to talk, to create, express and give…that is what is taking the Christ out of Christmas. It is so refreshing to see you and VCW putting Him back in by talking with people, creating a moment, expressing thoughtfulness and caring and giving something sweet and warm (and I’m not just talking about the Hot Chocolate). It is sobering that Walmart is currently the most common gathering place. Let me be quick to say that it isn’t the only gathering place. There are many cool ones. It’s just that Walmart reaches the broadest cross-section. I’m really hoping that touch of kindness (and warmth) will come back to them over and over this Advent!